Ideal for workteams that need advanced scanning and routing capabilities, high-quality colour, precise image control, intuitive process management and strong security. 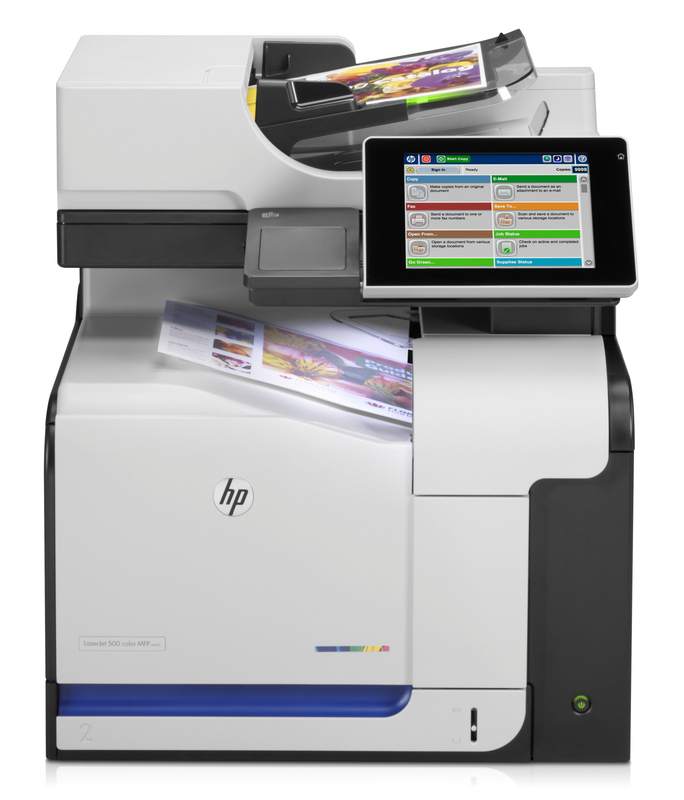 This desktop MFP is easy to upgrade with new capabilities and solutions. Get breakthrough performance, with best-in-class scanning for precise results. - Get fast results from two-sided, single-pass scanning and HP EveryPage1. Automatically remove blank pages. - Manage big jobs easily with the 100-sheet automatic document feeder1. Enter data on a large, pull-out keyboard2. - Do more with data using built-in OCR and multiple scan-to options. Produce clean, readable scans using auto-orientation, auto-page-crop, auto-tone and auto-deskew tools. - Preview, edit, insert and delete scanned pages on-screen. Launch one-touch processes from the touchscreen. Experience high-value colour on the big screen. - Manage jobs directly at this desktop-sized MFP, using the 20.3 cm (8-inch) HP Easy Select colour touchscreen. - Optimise colour settings with HP EasyColor. Get vivid results from HP ColorSphere toner at up to 1,200 dpi. - Improve efficiency by sending scanned documents directly to email, fax, or network folder4. - Receive value out of the box: this product is shipped with a full set of Original HP LaserJet toner cartridges. Enjoy top-flight manageability, extensibilty and robust security features. - Rely on powerful solutions to help regulate colour costs4 and to deploy and safeguard your fleet. - Robust encryption helps secure sensitive information – at rest on the MFP or in transit over the network5. - Protect documents with PIN printing capabilities, and add security solutions through the hardware integration pocket6. - Extend the capabilities of work-team print environments with a rich array of easy-to-integrate solutions. Reduced energy costs and your environmental impact. - Reduce energy use with HP Auto-On/Auto-Off Technology which turns your printer on when you need it and off when you don’t7. Conserve power with Instant-on Technology. - Prevent wasted paper: use automatic two-sided printing and PIN printing.